The acquisition of an admission ticket, a season ticket and/or a speedy pass implies the acceptance of the Regulations applicable to the visitors of the WALIBI and AQUALIBI Parks as well as these terms and conditions of sale, all of which documents are available on our website www.walibi.com / www.walibi.be / www.aqualibi.be. The seller of "Walibi Belgium" Tickets/Subscriptions is S.A. BELPARK (a subsidiary of S.A. COMPAGNIE DES ALPES), registered with the Business Registration Office under No. 0439.050.308, having its registered office at 1300 Wavre - Belgium. The management reserves the right to modify its rates at any time, without prejudice to the visitors with regard to the validity of the tickets/season tickets/speedy passes purchased before such modification. The price of tickets and season tickets is set according to the circumstances of the operation of an amusement park and weather conditions, all of which inevitably lead to all or part of the attractions and other services offered being temporarily inaccessible. 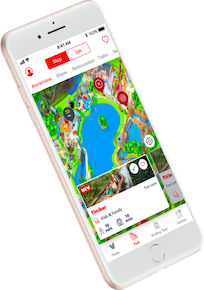 Whenever possible, the management ensures that visitors are informed of any disruption to the Park’s activities which it controls by regularly updating the agenda of the Walibi Belgium website. This desire to provide information for the sole purpose of limiting as much as possible any inconveniences that Park users may suffer may in no way be interpreted as the management’s acceptance to grant any price reduction on tickets/season tickets sold as a result of disturbances that were not mentioned on the Park's agenda. all or part of the attractions of the Park are or have been inaccessible during the period of validity of the entrance entitlement, for meteorological reasons or for reasons related to the operation of the Park (breakdowns of attractions, security problem, maintenance or renovation of attractions, restoration works, installation of new attractions, etc. ), all of which circumstances cannot in any case be assimilated to cases of force majeure. Even in cases of force majeure in the legal sense of the term, WALIBI's obligation will be limited to proposing to the visitor a new date for using their entrance entitlement impacted by the case of force majeure. Tickets/season tickets/speedy passes are strictly personal and cannot in any case be loaned or transferred. They are only valid if they can be produced together with the unexpired identity card of their holders. It is strictly forbidden to reproduce, duplicate or forge a Walibi Belgium ticket or season ticket in any way whatsoever. The fact of lending an entrance entitlement to a third party, as well as using and attempting to use an irregular entrance entitlement, besides being liable to criminal prosecution, will immediately result in the ticket/season ticket/speedy pass being confiscated, without possibility of reimbursement and without prejudice to the compensation of all the damage suffered. Walibi Belgium declines any responsibility in case of illicit use of an entrance entitlement following the loss or theft thereof, if such loss or theft has not been previously reported to it. The intellectual property rights of the website and its components belong to Compagnie des Alpes or to third parties. The sales agreement entered into by Walibi Belgium and the buyer shall not grant the latter the right to copy, reproduce, download, post, transmit or distribute any of the components of the Walibi Belgium website. Any dispute concerning the Walibi Belgium website and the sale of tickets shall be governed by Belgian law. The courts and tribunals of the district of Walloon Brabant shall have sole jurisdiction. The contracts entered into remotely via the "Walibi Belgium" website shall be entered into directly with BELPARK S.A. They shall be governed, when the purchaser of the ticket/season ticket is a consumer within the meaning of the Code of Economic Law, by the provisions of the said Code. Information detailing the products or services that can be purchased on Walibi Belgium's website constitutes an offer to sell. Unless expressly stated otherwise, such offer shall be valid, provided that it contains no material errors, as long as it is present on the official website of Walibi Belgium. Walibi Belgium shall not be liable for the information, prices, opening times that are listed elsewhere than on its official website. "Online purchase": Selection of the product(s) or service(s), and the desired quantity thereof. "Sign up": Identification with a username and password. "Holder profile": Communication of data concerning the other recipients of the order. (to be attached: photo of the holders of the park entrance passes/cards). "Delivery": The season tickets are to be collected from the reception desk of the Park, within the period indicated. Online tickets can be downloaded in .pdf or .jpg format after the payment has been validated. They must be printed on A4 paper in black and white or in colour. The purchaser may also produce such tickets directly on their smartphone at the entrance of the Park. "Summary": A summary of the order is displayed (order number, product(s)/service(s) purchased, total price, address and delivery particulars. Acceptance of the terms and conditions of sale and the Regulations applicable to visitors to which a hyperlink is proposed. Order confirmation. "Payment": Selection of the payment method authorized by OGONE. Acceptance or refusal of payment by the latter. Following the payment process, OGONE sends the buyer a confirmation message or a message inviting them to restart the payment procedure in case of problems. The contract shall be considered as having been entered into at the time of acceptance of the payment by OGONE. Since the payment module is managed directly by Ogone, none of the payment information is transmitted to Walibi Belgium, which declines any liability for the online payment process. As part of their relationship, the parties shall accept electronic evidence, such as e-mails and records within computer systems. E-tickets shall be valid if they are printed correctly on white A4 paper or if they are presented on a smartphone. Partially printed, soiled, damaged or illegible tickets shall not be accepted. The bar code must be legible. E-tickets shall be valid only on the date and under the conditions printed on the ticket. E-tickets that are valid for a specific period may only be used if the Park is accessible on that day, within the limits of its attendance capacity. In accordance with Article VI. 53 12° of the Code of Economic Law, customers shall not be entitled to withdraw their purchases. This chapter applies to group ticket sales for the Walibi, Aqualibi and Bellewaerde parks. For the purposes of these conditions, a group shall comprise at least 20 "paying" persons visiting the park on the same day. The “advantage” group rate: for bookings made at least 3 working days before the date of the visit. Bookings must be made by telephone, ordinary post, fax or e-mail. A booking modification at the preferential rate shall be accepted only if it is made in time to benefit from it. The attention of the organizers is drawn to the fact that the payment terms differ according to whether the booking is for "simple" tickets or packages including meals. All bookings must be confirmed by WALIBI, either by ordinary post, fax or e-mail. Such confirmation must be handed to the Park's ticket offices on the day of the visit. In case of non-receipt of the confirmation one week before the visit, please contact the groups department at +32 (0)10 / 42 17 17 (working days from 9am to 5pm). Group tickets can be sent to their recipients before the visit, if such request is made and payment is made at least 10 working days before the visit. Bookings can be paid in advance on the bank accounts listed below, at least five working days before the date of the visit. Failing this, payments must be made at the ticket offices on the day of the visit. from France: by check or bank transfer to the Crédit du Nord account: IBAN: FR76 3007 6028 9615 7598 0420 089 - SWIFT: NORDFRPP. from France: by check (company or associations) or to the Credit du Nord bank account IBAN FR76 3007 6029 1912 4607 0420 095 - BIC: NORDFRPP. For bookings including meals, a deposit of 30% is required as confirmation of the order. If the deposit has not been paid at least 10 days before the visit, the booking will be automatically cancelled, both as regards the entrance to the Park and meals. The balance of the price must be paid no later than the day of the visit. The final number of menus must be communicated at least 10 working days before the date of the visit. This number shall be the minimum on which the balance of the price will be calculated on the day of the visit. For Bellewaerde Park, meal times will be communicated at the time of booking. These times are also listed on the booking confirmation. Your table will be reserved for 15 minutes. To be refunded, any cancellation must be communicated by e-mail or fax at least 3 business days before the date of visit. In all cases, a € 40 processing fee will be charged. To be refunded, any cancellation of "group with meals" tickets must be communicated by e-mail or fax at least 10 working days before the date of the visit. The person in charge of the group will also be required to return the group tickets and meal vouchers by registered mail. The deposit will then be fully refunded, minus a € 40.00 processing fee. If the deadline of 10 working days is not observed or if the group does not show up on the day of the visit, all meals will be charged. Admission tickets and meal vouchers paid before the date of the visit: Unused admission tickets and meal vouchers must be sent to the bookings department by registered mail within 7 days after the date of the visit, together with your full details (booking number, group name, address, date of visit, name of your bank, IBAN code and BIC code - For France: RIB) Please return the tickets to: Belpark sa – A l’attention du service Réservations Boulevard de l'Europe 100 - 1300 Wavre - Belgium Any unused meal vouchers shall not be refunded. Admission tickets shall be refunded by bank transfer provided that the tickets have been returned by registered mail with full contact details. The number of free tickets will nevertheless be adapted. Admission tickets and meal vouchers paid on the day of your visit: Unused admission tickets and meal vouchers must be returned to the information desk on the day of your visit. Any unused meal vouchers shall not be refunded. Unused admission tickets shall be refunded by bank transfer taking into account an adaptation of free tickets. Unused admission tickets paid on the day of your visit that are not returned to the information desk on the day of your visit shall not be reimbursed in any case. If, on the day of the visit, it is found that there are not enough visitors to benefit from the group rate, the price of the admission tickets shall be recalculated to the normal conditions of access to the Park. For tickets and season tickets purchased from a reseller of one of the official channels, the buyer shall of course be bound by the contractual terms binding them to such reseller. The fact of the buyer entering the Park, however, shall constitute their acceptance of the General Regulations of the Park.